The Chattanooga Kiwanis Club Youth Foundation has named the Children’s Advocacy Center of Hamilton County as the beneficiary of a portion of the proceeds from this year’s Great Kiwanis Duck Race on Saturday, June 17. 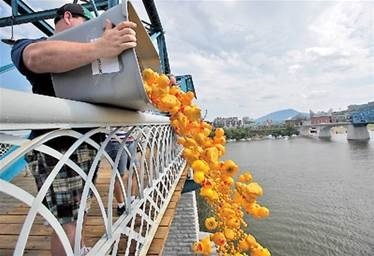 During the race, more than 5,000 rubber ducks will be launched from the Walnut Street Bridge and float down to the finish line near Coolidge Park. Each duck is numbered with a corresponding numbered ticket. If your duck crosses the finish line first, second, or third, you could take home a $2,000, $1,000, or $500 prize. Ducks can be “adopted” for $5 each. Get tickets by going online at www.cachc.org. Tickets purchased online will be emailed their duck number(s) within 72 hours of receipt. Participants must be 18 to participate and proof of age is required. The winner need not be present the day of the race. For more information, call the CACHC at 423-266-6918.